USA Today reports Aldon Smith, a San Francisco 49ers linebacker, pleaded no contest on Wednesday of this week to three felony weapons charges and two misdemeanor counts of driving under the influence of alcohol (DUI). The plea was made in a Santa Clara County Superior Courtroom in San Jose. Aldon Smith could be sentenced to a maximum of four years and four months in prison, although the judge may decide to give him no time in jail. Decisions are made at the judges discretion. The hearing to decide the sentence will be held in late July, after the San Francisco team has already started training for the new football season. According to Santa Clara County District Attorney Jeff Rosen, Aldon Smith has accepted responsibility for his actions and pled to all of the charges which were filed against him. 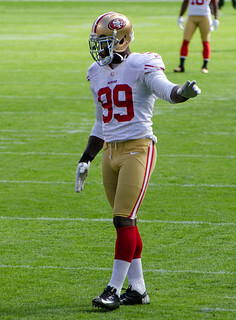 Aldon Smith was arrested in June 2012 when deputies arrived at his home to investigate a complaint about a party in Smiths home. The arrest came after Smith allegedly fired a handgun in the air and was stabbed. Two other people were also stabbed and injured at the party. Smith was also charged with three felony counts of illegal possession of an assault weapon, in which he pled not guilty. Although Smith had legally purchased the rifles in Arizona, he did not have the legal right to possess them in California. Aldon Smith was charged with DUI in September after he drove under the influence of alcohol and drove his car into a tree in San Jose. According to reports, Smiths blood alcohol concentration level was twice the legal limit of 0.08%. In addition to the charges listed above, Aldon Smith also had another incident at an airport last month where he began screaming at security and allegedly made threats that he had a bomb. Authorities continue to investigate this most recent incident and will decide if charges should be filed against Smith. Smith needs to pull it together. He has been described as a fearsome pass-rusher, and by all accounts could have a good career in the NFL if he is able to conquer his demons. Admittedly he has a problem with drugs and alcohol which he tried to get treatment for last season.